Connecting Systems Stymied by Car Lots? Hamilton's Trails Master Plan has a planned trail connection that would link the busy Hamilton to Brantford Rail Trail to the Spencer Creek Trail system in Dundas. 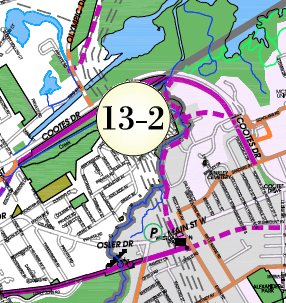 The new trail would run roughly north - south along the Ancaster Creek valley between Main/Osler and Cootes Drive, and run parallel to the creek through McMaster's west campus, further enhancing McMaster's position as a hub for a regional network of trails. Trouble is, there needs to be enough room to fit the trail along the Ancaster Creek and McMaster's parking lots, which would require McMaster to act on their Campus Master Plan's call for a minimum 30m naturalized buffer between the creek and the McMaster parking lots in Lot "M."
Unless McMaster fulfills this (minimum) requirement, any chance of a connecting trail will be weakened (hikes will be through paved parking lots), if not abandoned.